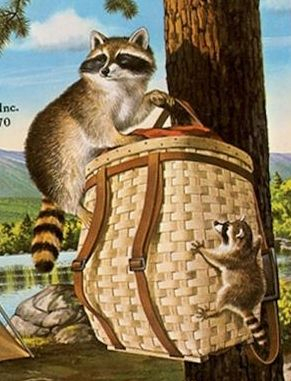 Summertime and the raccoons are coming! They are coming into my detached garage, the nighttime abode for my two cats. The other morning, I went out to see the felines in the garage. I noticed that the water bowl was filled with mud and the pale yellow sheet which covers the Cat Table (under which resides The Cat Bed) was covered with dried mud and rather long claw prints. Annabella, the green-eyed cat, was so jealous! Gabrielle, the Snowshoe, took a totally different approach. She marched into the garage, much like Sergeant Tibbs (of 101 Dalmatians fame). Clearly something had to be done and I was not doing it! Night 2 arrived. We decided, in view of the scorching heat wave (100-105 degrees F), to almost completely close the three large, vintage (read very old) windows in this huge garage that has been likened to a barn. The next morning, Annabella was a bit more patient with her look of incredulous indignation. Gabrielle was sniffing all around the floor. She gave special attention to a pile of cardboard boxes that needs to be recycled. Yes, Rocky Raccoon, Jr. had returned! “We” decided to hide the cat food bucket and leave out a paper bowl with some dog kibble. Night 3 passed by. Bridget the Beagle did her part, as she did the previous two nights, by barking and chasing the thing at 2 in the morning. She probably chased it right into the garage! Rocky ate all of the dog kibble. By Day 4 of Rocky Raccoon Jr. and the heat wave (105), I began to feel a bit beleaguered while I worked on researching the etymology for names, edited a few essays, and cut out fabric pieces for a quilt I’m designing. 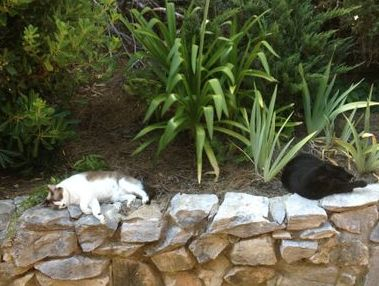 Late that afternoon, as is my routine, I ventured forth from the house (charging through the Wall of Heat) to visit the cats on their rock wall. Each cat was laying, like a pelt, on the cool soil beneath the Cobra mister and damp green foliage. Gabrielle, on the other hand, just looked up at me with those pitiful bleary blue eyes, opened her mouth, and, with a last gasp of energy, uttered the momentary silent scream. I promised them that “We” would bar Rocky from the garage that night. Dear Husband had informed me that morning that on Night 4 we were going into Full Lockdown! It was the theory of Dear Husband that Little Rocky was getting into the garage through a hole in the wall by the dryer. It is an air vent that is no longer used. The critter had become trapped in the garage with the windows sealed shut and had clawed its way out of the place by forcing open a rather large wooden folding door to the larger bay. The thing must have been panicked. And the cats were undoubtedly in the rafters! Dear Husband boarded up the hole in the wall from the outside of the garage. When I went to say good-night to the cats on Night 4, Annabella was roaming around, perhaps trying to find the best hiding place. Gabrielle, however, was positioned on top of a pile of folded towels on the small refrigerator next to the secret passageway, the boarded-up hole in the wall. She was vigorously grooming herself and looked very alert and determined. I mentioned to Dear Husband that she is preparing herself for battle, much like the Celts. All she lacked was the blood smeared on her pretty little white chest. Day 5 dawned and the heat wave continued. But there was no sign of any visitation by Rocky Raccoon, Jr.
Annabella is once again quite happy, calm, and sleek. There will be no living with Gabrielle for an extended period of time. This Snowshoe is utterly regal in her victory. She believes that she and she alone, perched at the ready atop that pile of folded towels, was the one who stopped Rocky in his tracks outside the garage, to the rear of her sensitive fox-like ears. She fully expects the Victoria Cross hung about her lovely neck. And she does deserve a medal for bravery. I just wish that Annabella, the black cat with the special powers, would put an end to this blast furnace of a blasted heat wave!